The boat that will lead the river pageant celebrating the Queen's Diamond Jubilee has been launched today. A million-pound row barge, built specially to mark the 60th year of the Queen's reign, has been launched on the River Thames. The 94ft vessel is ornately carved and decorated with gold leaf. It also features wood from sweet chestnut trees grown on Prince's Charles's private estate. 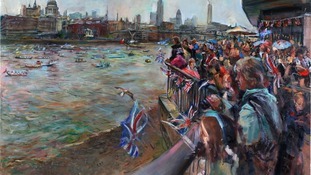 Later this summer, it will lead the flotilla of boats taking part in the Diamond Jubilee river pageant. Including 18 rowers, it will carry 52 people. The Queen will formally name the barge Gloriana when she visits Greenwich next Wednesday to open the relaunched Cutty Sark attraction. Later today, the royal row barge 'Gloriana', will be placed in the water the first time. It will lead the flotilla of boats during the Diamond Jubilee river pageant, ahead of the Queen's boat the 'Spirit of Chartwell'. Specialist craftsmen have spent the last 18 weeks creating the vessel in a secret location. The boat that will lead the procession down the Thames for the Queen's Diamond Jubilee Pageant will be put on the water later. 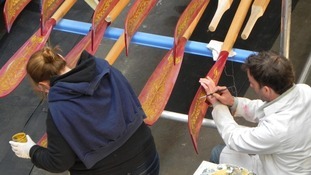 The royal row barge 'Gloriana' is the only boat to be constructed from scratch for the event. Boat-builders have been working on it in a secret location for the last 18 weeks. Along with the Spirit of Chartwell, which will carry the Queen down the Thames, Gloriana will be one of the most prominent boats in the pageant.